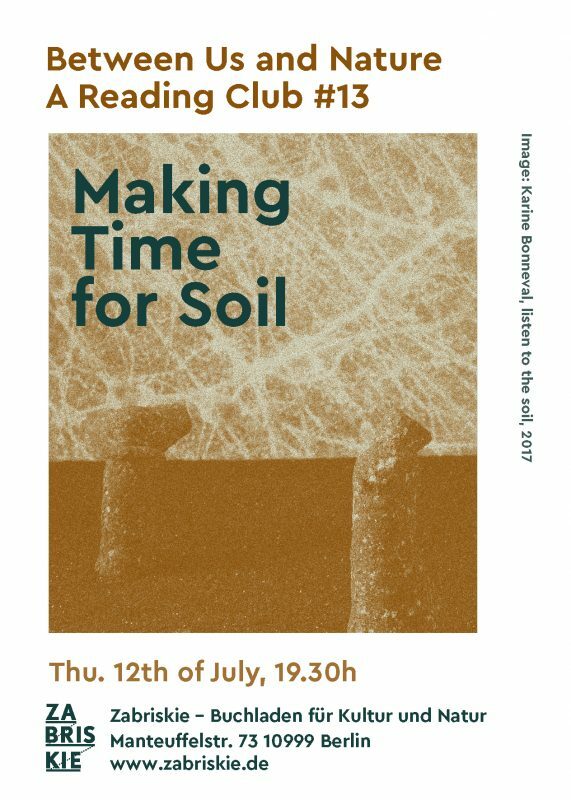 We will dedicate the coming two sessions to soil with a selection of texts recommended by Alex Toland, who is a researcher in visual arts, soil culture, urban ecology and the anthropocene. In session #13 we will read poems, papers in a garden and delve into the soil. and slumber grabs my arm. My heart is full of yearning. burn out before the morning. The rain pours down my shirt. I’m cozy in the dirt. “The Campfire” Y. Koumpan, “To Join the Real and Mental Place: The Written Earth” Suzanne Mériaux, “Soil and Culture” ed. Edward R. Landa and Christian Feller, Springer, 2010, 192. Alexandra Toland is a visual artist and landscape planner based in Berlin. She was a German Research Foundation (DFG) fellow in the “Perspectives in Urban Ecology” graduate research group in Berlin, and recipient of an Andrea von Braun scholarship in 2013. She has lectured at the Technical University of Berlin, Leuphana University, and the University of Arts Berlin, and has co-chaired the German Soil Science Society’s (DBG) Commission on Soils in Education and Society since 2011. Since 2018, she is Junior Professor for Arts and Research at Bauhaus University Weimar. Her interests include: environmental art, urban ecology, soil protection, and transdisciplinary processes. She is also an enthusiastic beekeeper, vermicomposter, forester, and mother of two. In ‘Between Us and Nature – A Reading Club’ we read together texts related to natural sciences, art, anthropology, postcolonialism, and (post)anthropocene, chosen from a female perspective looking beyond disciplines. Please rsvp via email to betweenusnature@gmail.com and we will send a selection from the book to those who would like to attend the reading session.